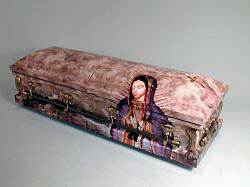 For most traditional services the body is placed in a casket and there is a visitation that will take place. After the visitation a funeral service is held. The service can take place at a church or even right at our funeral home. After the service the body is buried in a cemetery or entombed in a mausoleum. For those families preferring cremation, many options are available. We offer memorial services or a full funeral with visitation, followed by cremation. We also offer minimal cremations for those families preferring no ceremony. We own our crematory so your loved one never leaves our possession. At the Peterson Chapel we offer our services at no charge to the families affected by an infant’s death. We will provide a visitation with a funeral service, or simply a graveside service. The combination casket/vault are also something that we provide free of charge. Maria is a Spanish Family Advisor with the Peterson Chapel. Maria has served in this capacity for over five years. Maria is a native Spanish speaker and has taught Spanish in local schools for 15 years. Her experience and knowledge assist The Peterson Chapel in caring for the concerns and needs of the Spanish speaking community. Maria and her husband have four adult daughters. Maria es una consejera de familias cuyo lenguaje es español con la Casa Funeral Peterson. Maria a servido en esta capacidad por más de cinco años. El lenguaje principal de Maria es español, ella a trabajado como maestra de español en las escuelas locales por 15 años. Con su experiencia y sabiduria ella le asite a la Casa Fueral Chilson y sus cliente. Maria y su esposo tienen cuatro hijas. Specialists in shipments into and out of Mexico. Especialistas en envio a Mexico y afuera de Mexico. Our wide choice of services allows families to select only those services that are affordable to them. Sometimes people are hesitant to discuss cost, but we want to be open about all aspects of our services. Please feel free to call anytime for an exact cost estimate.